Identifying the problem is the first step to treating a child or an adult who is struggling at school or work. Testing is critical, and in cases related to functional vision problems, it could prevent the need for unnecessary treatments and/or medications. 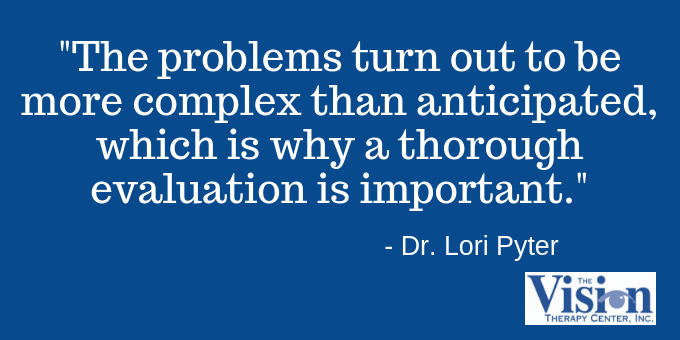 Clinical psychologist Dr. Lori Pyter is an expert at evaluating and finding the cause of a person’s struggles, and she’s seen many vision-related issues with her patients. Dr. Pyter is a licensed clinical psychologist who specializes in comprehensive neuropsychological and psychological testing for children of all ages, as well as adults. 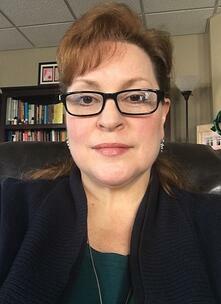 She works with a team of skilled clinicians through Creative Solutions Psychology Center. “People come to see me when they have some sort of problem that is negatively affecting how they’re functioning in their lives,” she said. “My job is to figure out exactly what the problem is, what’s causing it, and to create a plan for how to make it better. Dr. Pyter has identified issues including depression, anxiety, dyslexia, ADHD, and of course, functional vision problems that can affect emotional, social, academic behavioral development. In many cases, the people she’s evaluated have arrived at her doorstep after trying a few different treatments, finding that they have not helped. So, by the time they reach Dr. Pyter’s office they are frustrated. This is a familiar scene at The Vision Therapy Center. 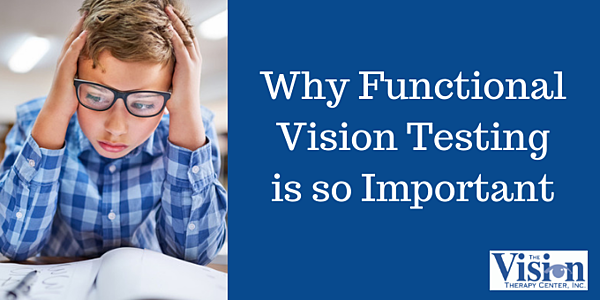 In many cases, people are unaware of functional visual problems and why they matter so much. “Many people just have no idea about how vision impacts a child,” Dr. Pyter said, or how vision impacts learning and performance. 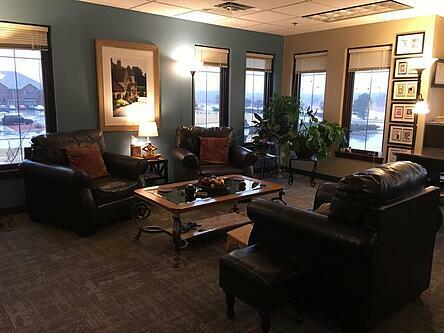 Based in Brookfield, Wisconsin, Dr. Pyter provides neuropsychological, psychological and academic testing services to patients throughout southeastern Wisconsin. Her testing is based on the patient’s challenge, and can include academic, intellectual, sensory, mood, behavior problems as well as anxiety, depression and attention challenges. The testing process helps her understand whether the problem “is a disability or just a struggle.” She may work collaboratively with a physician or developmental optometrist to understand a patient’s medical and visual issues and how they might be affecting mental health or academic functioning. Then a balanced, collaborative intervention plan can be developed to address all the issues of importance. 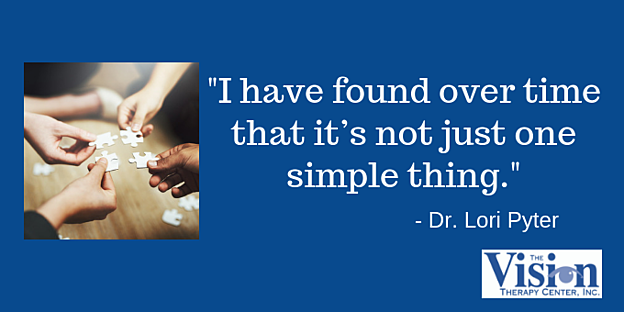 “I have found over time that it’s not just one simple thing,” she said. “It can be an underlying learning disability, a sleep disorder, stress, or it can also be a vision problem.” Being open to all the influential factors makes the treatment plan much more effective. Dr. Pyter uses a series of standardized assessment measures to understand how people track visuals, learn and process information. When she sees a particular pattern emerge, she refers the client to The Vision Therapy Center. Typically, these are issues that include functional visual skills - eye tracking, teaming and movement. “It’s how your eyes work together, not just whether you can see what’s in front of you,” she said. In some cases, a patient may have a vision problem that is mistaken for another disorder. Testing is used to make sure the causes for the problems are identified with accuracy and that the treatment plan isn’t based on guesswork. Dr. Pyter notes that she’s often referred children to The Vision Therapy Center whose parents believed their child was struggling with ADHD. Instead, a Functional Vision Test revealed it was Convergence Insufficiency and knowing this information drastically changed the intervention plan and prognosis. Dr. Pyter first learned of The Vision Therapy Center many years ago. She recalls seeing a young patient who had first been at The Vision Therapy Center. She read the report on the child’s functional vision, and immediately became curious about functional vision and how it applied to her clients. “I’m always looking for ways to learn more about how the mind and body work together and to find ways to help my clients thrive,” she said. With so much overlap, a long-term relationship has developed. 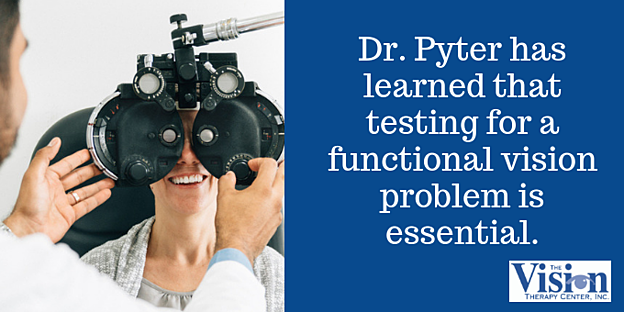 Dr. Pyter has learned that testing for a functional vision problem is essential, and can help pinpoint the issue. The ADHD case mentioned earlier is a prime example. “Many parents think their children has it,” she said. But just because a child struggles to read or to sustain attention on reading doesn’t mean it’s ADHD. There are many potential causes. Dr. Pyter said that learning about all types of potential issues that can affect your child is critical. “The more you understand and clarify the range of issues, the better you can help your child develop and learn,” she said. It’s also critical not to delay exploring all the potential issues, or to just sit back and hope a child will “grow out of it.” The earlier an issue can be detected and treated the less likely it will develop into a major problem. Early intervention is key. “Parents may view some challenges as just a phase. They hope the problems will just magically go away,” she said. Unfortunately, they don’t, and the consequences for not doing something to help a child can be far worse than for children who do get treatment. “Dropping out of school, drugs, unemployment: The chances all increase if you don’t act early on,” Dr. Pyter said. Trust your instincts, she urged parents. And take action. To learn more about Dr. Pyter and her team of treatment professionals visit www.PsychEval.org and Creative Solutions Psychology Center.